Check out this quick 7 minute video for how I configure my local PowerShell console with both Microsoft and community cmdlets. Remotely manage Office 365 sites with Global Administrator rights or even simple Power User. Options exist for all access levels. Please leave a comment if you found this helpful. Enjoy! Yesterday I published a new CodePlex project to automate PowerShell remoting. 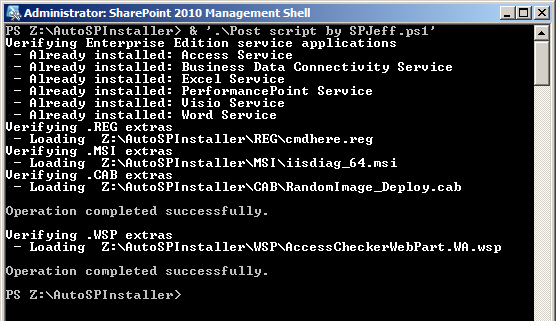 Basically I got tired of RDP-ing to 10 machines to type the same command 10 times. 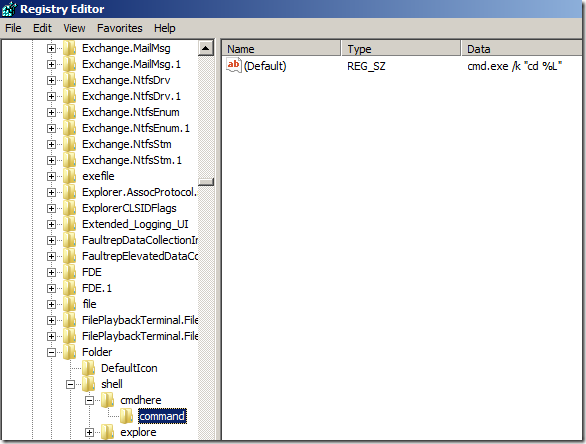 Why not use a local PowerShell window to read CSV with server names and execute remotely in bulk? Well, now you can. Give it a try for an hour to download, setup, and run. 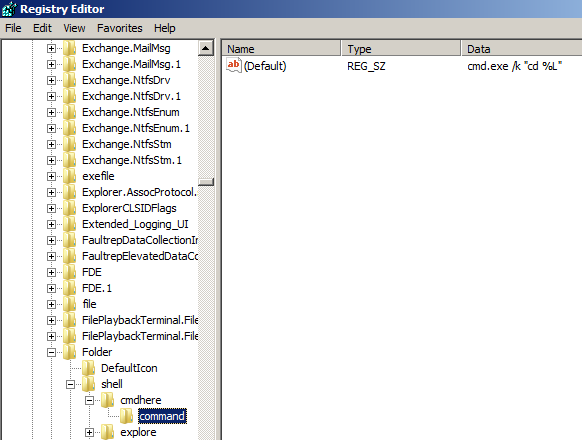 You can save that much time in just a day by using this in instead of juggling RDP and typing multiple PowerShell commands. Please leave a comment or CodePlex review to let me know what you think. and user account before any commands can be run. Enable PowerShell client with "Enable-PSRemoting -Force" and "Set-Item wsman:\localhost\client\trustedhosts * -Force"
Account lockout – Possible if typing the password wrong and open many sessions at once. 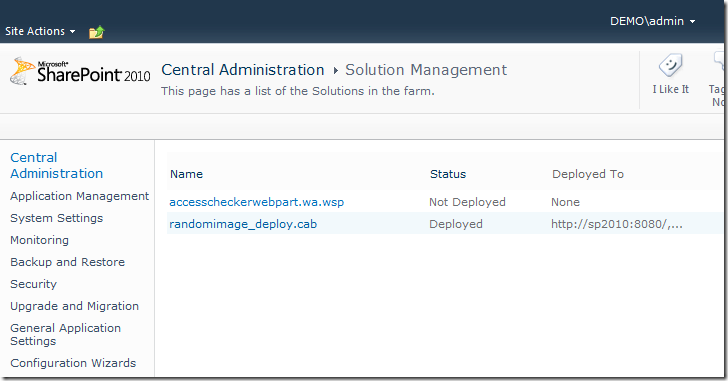 System update – Verb CSV can modify configuration on many servers quickly. Use carefully for changes. Please drop me a line via email spjeff@spjeff.com or Twitter @spjeff with ideas. I’m always open to suggestions and improvements. 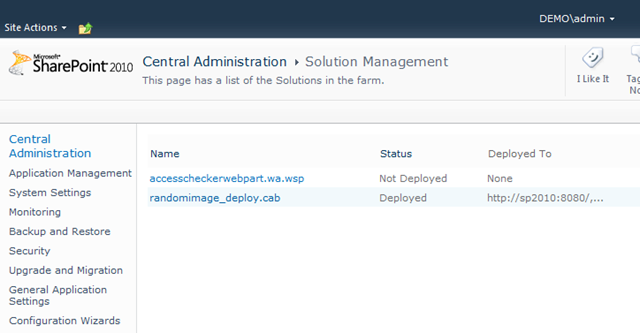 Recently I’ve tested http://autospinstaller.codeplex.com/ from @brianlala to build new SharePoint farms. 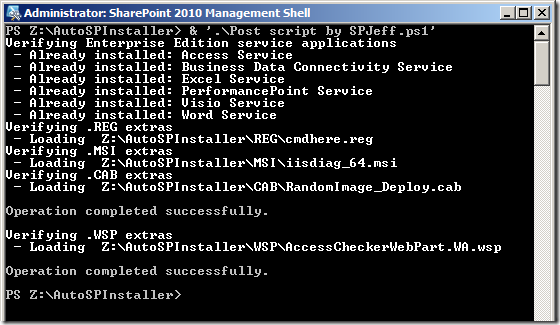 It’s a wonderful script and a great way to learn SharePoint cmdlets with real examples. So I wrote a small script to run after Brian’s and setup these small things. Caution: my scripting skills are limited and the Third Party will always run (no detect if installed ) so you may not want to run this repeatedly. Disclaimer aside, I think it’s pretty cool. I plan to use this and thought others might find it helpful too. I will update this blog post as needed and cross link to CodePlex. Please leave a comment with feedback! Write-Host -ForegroundColor White "Verifying Enterprise Edition service applications"
$hosted = Get-SPServiceApplicationPool "SharePoint Hosted Services"
Write-Host -ForegroundColor White " - Creating Access Service:"
Write-Host -ForegroundColor Blue " Complete"
Write-Host -ForegroundColor White " - Already installed: Access Service"
Write-Host -ForegroundColor White " - Creating Business Data Connectivity Service:"
Write-Host -ForegroundColor White " - Already installed: Business Data Connectivity Service"
Write-Host -ForegroundColor White " - Creating Excel Service:"
Write-Host -ForegroundColor White " - Already installed: Excel Service"
Write-Host -ForegroundColor White " - Creating Performance Point Service:"
New-SPPerformancePointServiceApplicationProxy -Name "PerformancePoint SA Proxy" -ServiceApplication "PerformancePoint SA"
Write-Host -ForegroundColor White " - Already installed: PerformancePoint Service"
Write-Host -ForegroundColor White " - Creating Visio Service:"
New-SPVisioServiceApplicationProxy -Name "Visio SA Proxy" -ServiceApplication "Visio SA"
Write-Host -ForegroundColor White " - Already installed: Visio Service"
Write-Host -ForegroundColor White " - Creating Word Service:"
Write-Host -ForegroundColor White " - Already installed: Word Service"
Write-Host -ForegroundColor White "Verifying .REG extras"
Start-Process -Wait -NoNewWindow -FilePath regedit.exe -ArgumentList "/s `"$reg`""
Write-Host -ForegroundColor White "Verifying .MSI extras"
Start-Process -Wait -NoNewWindow -FilePath msiexec.exe -ArgumentList "/i `"$msi`" /qb"
Write-Host -ForegroundColor White "Verifying .CAB extras"
Start-Process -Wait -NoNewWindow -FilePath stsadm.exe -ArgumentList "-o addwppack -filename `"$cab`""
Write-Host -ForegroundColor White "Verifying .WSP extras"
Start-Process -Wait -NoNewWindow -FilePath stsadm.exe -ArgumentList "-o addsolution -filename `"$wsp`""